No, not ones made out of twisted straw but rather of tin and lead! Here are the four new elephants for the looking Raphia Game. 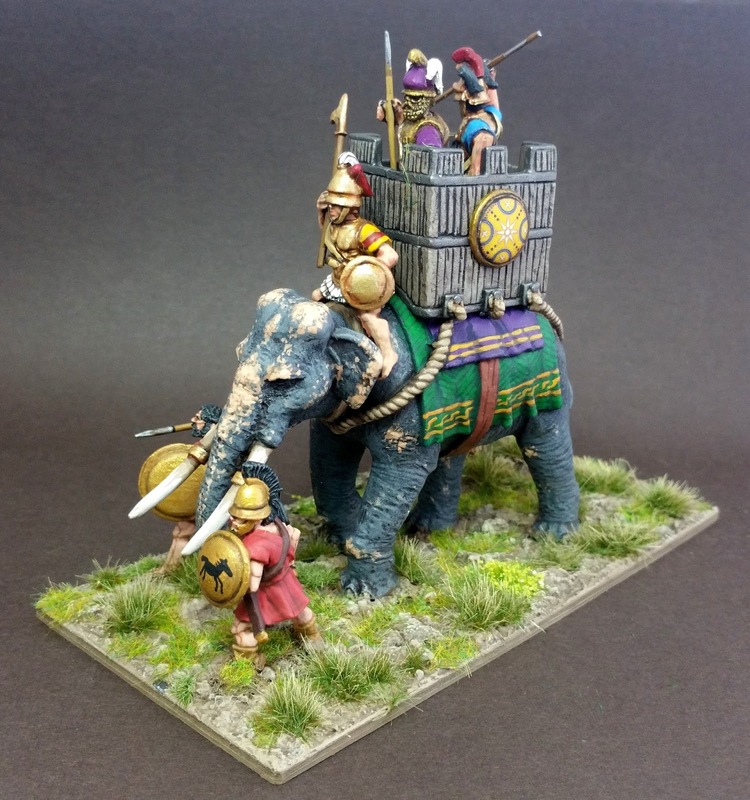 All of the elephants and most of the crew were painted by mate Shaun McTague although I added some detailing, notably the skin pigmentation, washes and based them. All of the photos are clickable! 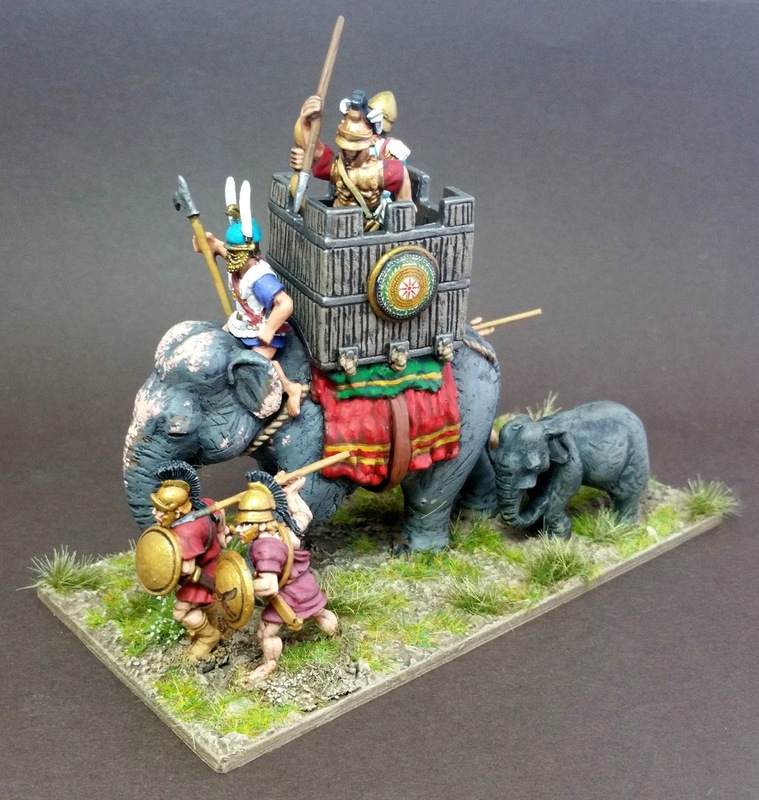 Three of the elephants are superb Aventine Miniatures and the fourth (on the right) is a solid lead beast from Timeline Miniatures with an Aventine howdah and crew. She weighs an absolute ton! Above and below, Shaun did a magnificent job on the drapery. I have finished these with a Pyrrhic vibe- later I plan to get some specifically Seleucid armoured elephants painted up, with proper red ears. Above, Indian elephants tend to fade to pink as they get older; think bald patches. 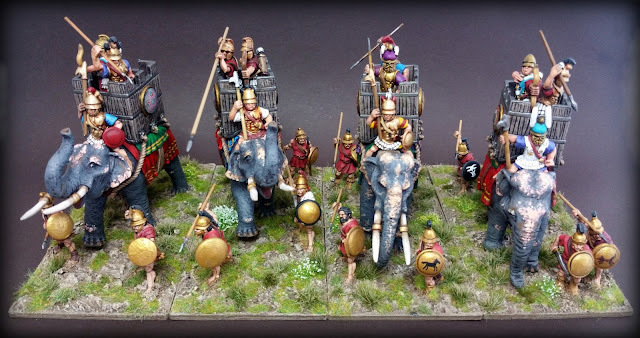 These are very old nellies, being part of Alexander the Great's own herd, passed down to Pyrrhus like family heirlooms through several generations of Successor owners. The elephants are escorted by Wargames Foundry javelinmen that I bought from Steve Marshall. 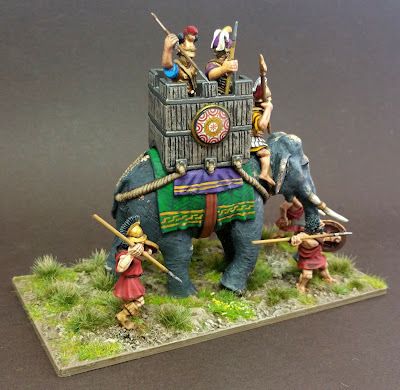 Last but not least the tusk-less cow (above) is a Timeline Miniatures model with an Aventine Howdah. I think of her as Mrs Jumbo and that is, of course, Dumbo behind her. 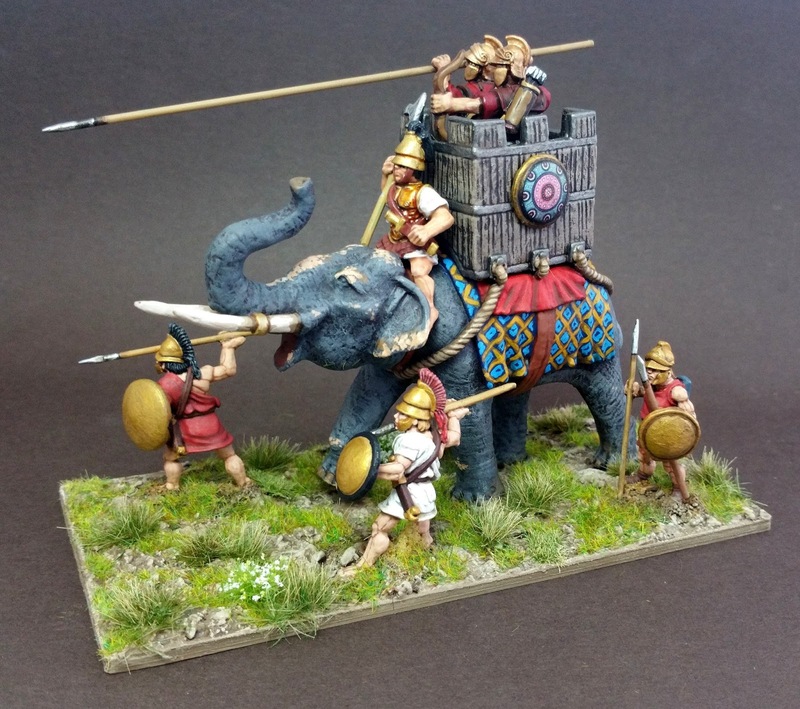 At the battle of Beneventum the Pyrrhic elephants panicked after such a cow became concerned for her calf and rampaged back through their own lines. There will be 11 elephants altogether in the Raphia game. Because there is no room for baby Dumbo at the Salute Inn, the battle will instead be fought exclusively at the Wargames Holiday Centre over the weekend after Salute (22nd-24th April), along with the Sabis (thousands of Celts; I bloody hate Celts! ), Leuctra (with a spanking new Theban army), the vast Cremona 69AD game and a Late Roman bash. 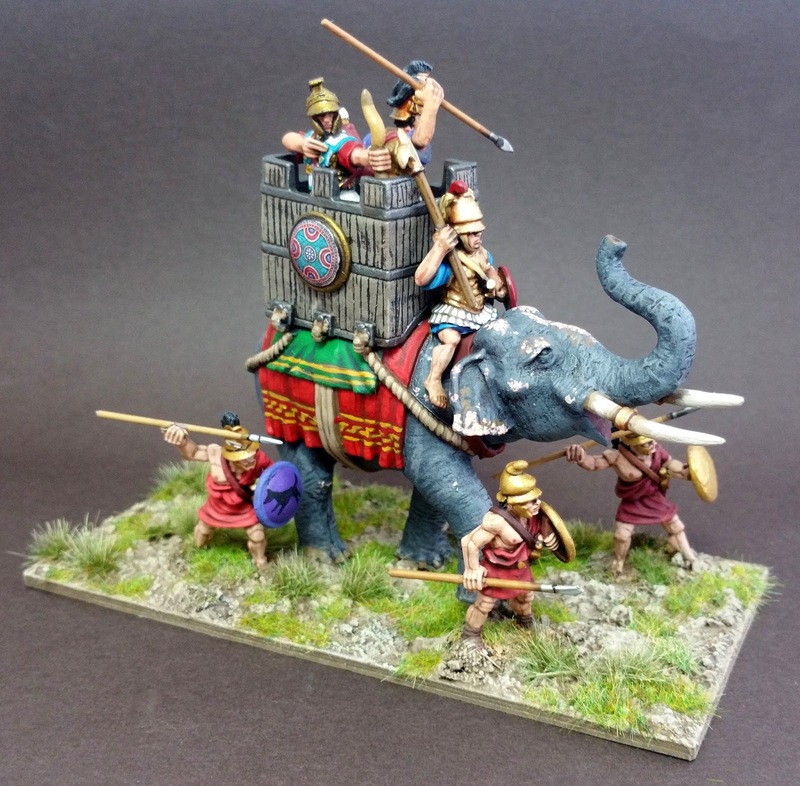 A weekend at the Wargamees Holiday Centre is a very fine experience, indeed, and Mark tells me he still has a couple of places left... you can book here.